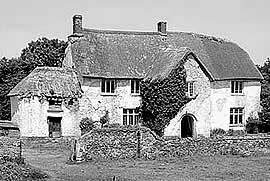 Winkleigh Village History, Devon, England with Photographs | Battle of Torrington, Civil War, Risdon county survey, All Saints Church, Castle, battle, manor and black death, Cromwell, Charles II and the Roundheads | Photographer Jackie Freeman photography. In the reign of King James I of England, Tristram Risdon, who was an antiquary & topographer, which is the posh term for, I can write and own a compass, was commissioned & inspired to catalogue, survey and record the county of his birth. Devon. The Survey of Devon ! Risdon first tells us that: "Michael de Southcott was Lord of Southcott, (up behind Gray's Bridge farm ) "from whom issued divers families. For he was the original of a great kindred in this country"
He also confirms that; "There was also another great house at Lousdon / or Lollardsdon (between Winkleigh and Iddersleigh) and that Robert de Pole was the Lord of the Manor." But what of these places now? Photograph: Croft Castle site and ruins - Winkleigh - Devon. Southcott farmhouse situated on the site of Michael de Southcott's manor house, was rebuilt in the early 19the century as the original manor had been completely destroyed by fire in the reign of George IV. One of the more interesting features on the Southcott site is this section of ancient outbuildings on the right, which probably forms part of the original Southcott Manor stronghold. Its old ruins seem to echo its forgotten past and suggest, as archaic accounts have it, that there was a gallows sited here in medieval times. Southcott Farm is now a very successful equestrian cross country and eventing centre and a venue where horse riding and rider training has been established for several years. It's now a great draw for the area with regular events. Thanks to Roger & Rosemary Bland for their assistance and permission to chase their sheep for our photography ! 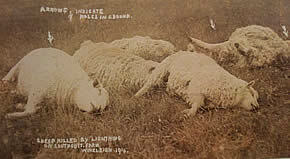 Postcard 1914: Sheep killed by lightning on Southcott farm. Or is this the result of a visit from the Winkleigh Firedrake Dragons? Lollardson Manor or Lollardstowe, (Vulg; Lousdon - Aka Loosedon) was originally in Saxon times the lands of a baron called Gotceline. he was around in the reign of Edward the Confessor. But by the thirteenth century, the property had devolved to Sir Robert de Pole, yet another Frenchman enjoying his spoils & he was Lord of the Manor thereof in the reign of Edward the first. The property then passed into the hands of the Cole and Bury families & much of its land partitioned and sold.. The original manor house, seen in these old photographs, was sadly demolished in 1962 as the building became unsafe and fell into disrepair due to damp. A modern barn now stands in its place. Images courtesy: Mr and Mrs Tony Dallyn. Loosedon Manor, now a Barton, [a name which is derived from the time when farms that grew barley were called Bartons] held over 300 acres at one time within its endowment and has an interesting history in itself. For generations, it was argued over its views no doubt, which are both panoramic and stunning looking out over the expanse of Devon and Dartmoor with Exmoor and the sea distant. They are superlative and far reaching panoramas and impossible to paint. It was to all intents and purposes a splendid house in its time and apparently used for many years as a hospital and at another time lived in by several families together. A previous owner recalls that it had four separate staircases and servants quarters, as well as several farm workers cottages and at one time. Like all great houses of nobility, it had its own church and extensive grounds. It was modern too, with a double toilet in the garden which was called an earth closet, for obvious reasons, with ultra mod-cons for the time frame, wooden seats. To top this, unlike most properties of its kind, It also had it's very own water pump, but 'in' the kitchen. and the kitchen itself was modern too, with a fully tiled pantry and thrall which served as an excellent refrigerator and on which food would last for several weeks. Loosedon boasted a walled vegetable and fruit gardens and orchards were as productive as they were extensive but the house had a terrible reputation for damp. This was utterly uncontrollable and it emerged from the floors and not the walls. It was so bad as to make the floors turn green under the beds and whatever was left on the floor became wet! As a hospital it can't have been so good. It probably made more people ill than it cured! de Keynes family - or Court Castle. Earth works remains. Winkleigh, Devon. he castle mound to the west of the village called Croft Castle and it is speculatively sited on what is believed to be an ancient bronze age barrow or burial mound, dating back to around 2500 - 2600 B.C. Not doubting that this may be so, this would indicate that the first inhabitants of the Winkleigh area were likely to be bronze age farmers and well advanced as a civilisation who would have been talented archers too. Men that wore stone wrist guards to protect their arms from the friction of the bowstring. And talented weavers who began the industry which was to support the village for eons. They would have been a people who were also amongst the first metal smiths in Britain, working in copper first and some, eventually in gold. Later they used the metal we now call bronze which has given its name to this era. In his book, the history of the manor & church of Winkleigh, in the county of Devon, according to Charles Worthy, Keynes Castle in Winkleigh was formerly the manor house and was, " an imposing structure that must have once been a place of great strength, stood upon an oval mound, 144 feet across from north to south, and 104 from east to west, and 44 feet high, and it is still nearly surrounded by a deep moat . 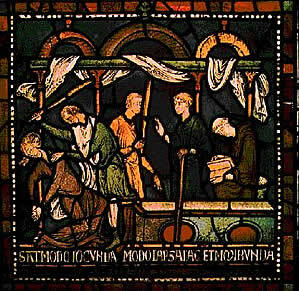 It had been in the hands of the all powerful Keynes family possibly as early as the reign of Henry II [1154-1189], with the hero of the hour the Great and stout knight Sir William de Keynes, a ferocious fighter who supported the Empress Maude and her son Henry, who later became King Henry II. Winkleighs William made a real name for himself at the Battle of Linclon where he captured the King, Stephen which launched the career of the young prince who became King Henry II. "Then might you have seen a dreadful aspect of battle, on every quarter around the king's troop fire flashing from the meeting of swords and helmets - a dreadful crash, a terrific clamour - at which the hills re-echoed, the city walls resounded. With horses spurred on, they charged the king's troop, slew some, wounded others, and dragging some away, made them prisoners. No rest, no breathing time was granted them, except in the quarter where stood that most valiant king, as the foe dreaded the incomparable force of his blows. The Earl of Chester, on perceiving this, envying the king his glory, rushed upon him with all the weight of his armed men. Then was seen the might of the king, equal to a thunderbolt, slaying some with his immense battle-axe, and striking others down. Then arose the shouts afresh, all rushing against him and him against all. At length through the number of the blows, the king's battle-axe was broken asunder. Instantly, with his right hand, drawing his sword, well worthy of a king, he marvellously waged the combat, until the sword as well was broken asunder. On seeing this William Kahamnes, (Keynes) a most powerful knight, rushed upon the king and seizing him by the helmet, cried with a loud voice, 'Hither, all of you come hither! I have taken the king! " By 1630, when WESTCOTE wrote his "View of Devonshire", the castle was; "ruinated by time and overgrown with tall trees". John KEYNES who came from the same illustrious family, was also a man of considerable influence because in about 1399 in the first year of the reign of Henry IV, he was appointed High Sheriff of Devon. The castle's complete history remains lost and mainly unrecorded, its true purpose a mystery and its people and their story forgotten in time. It's not many Devon villages that can boast of having their very own Dragons, so don't be surprised as the pubs close on a dark Devon evening to see the odd Dragon or two whipping around the village of Winkleigh. Two 17th century writers recorded a brace of Dragons that lived here in Winkleigh in the 1600's but there are scant details or accounts which is a shame. But the Druids believed and still do, that a Dragon flies every night between the hill fort of Dolbury Hill and Cadbury Hill just to the east of Winkleigh in Heywood, timelessly guarding valuable treasure that is buried there. These winged serpents are said to inhabit the forest around Burrowcleve, Heywood, and Winkleigh Wood and leave their tell tale signs of recent occupation in the log grasses to the side of tracks and are often seen by dog walkers. In these areas, no birds sing. These inexplicable flat areas turn up like crop circles where the Dragons are said to have rested from their nights guardianship. The last dragon seen near Winkleigh is reported to be about the size of a human & "had a hiss which could be heard for miles around! " Remember, within the Druid tradition, a flying dragon is a creature of the Sky God and very serious indeed. He is a protector and as powerful as lightning and thunder and can leave terrible destruction in his wake. 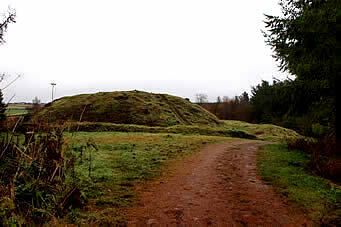 Many of the Devon Dragons were said to have resided within groups of Bronze Age round barrows and of course there is a line of these barrows (burial mounds) in the Winkleigh area and one of the Winkleigh castles is even built on one. 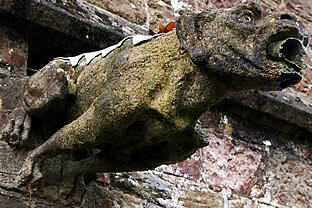 You only have to look towards the church building to see that the Winkleigh Dragons must have been real! 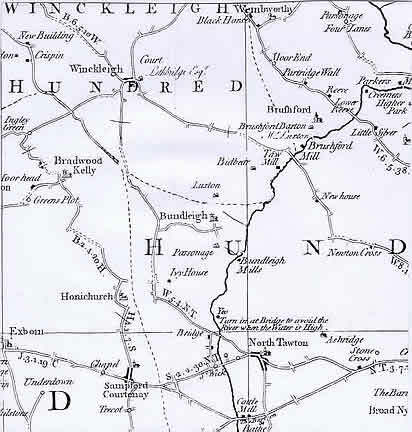 Winkleigh or Wicheleie as it was first called at the time of the Norman Conquest and recorded in the Doomsday Book of 1085, has a number of variations of argument when it comes to pinpointing its name origins. Wincheleie: Winchelia, Wynckeleighe, Wynkelegh Winkly Beacon, Winkelea, Winkley, Winkley Keynes, Winkley Tracey and Winkleigh ! A further record of the reign of King Edward II calls Winkleigh - Et Curia Ibidem. For a time it was called the Fee of Gloucester then the Fee of Winkley. So there are several variations of the villages name as you can see, all which appear documented throughout its history and yet there does seem to be a link in their origins. More a common denominator in there amongst all the different definitions that people give it , so at the end of the day, make your own mind up. But the root is obvious. Many people believe that Winkleigh derives its name from the words Wink and Leigh - which when separated can be defined as Wink, which is a corner and Leigh, or Leah, meaning a clearing or a high place. BUT! Wincel or wencel on the other hand, is also Old English and just to complicate things, it also means a bend in the road or a clearing near a bend in the road. However, you are selling yourself short here. and they were here first! So it's obvious that the root of the word Winkleigh is back there somewhere & is NOT as modern as Old English. The issue of origin then has been further confused by much earlier definitions and translations of the word Winkleigh. Wineca is the very first form of what became the old English word Wincel and before that, Wincel or Winc'. And Winc was definitely recorded as a Saxon persons name. So it's a proper noun. That's true, I didn't make it up. Eggesford too has its roots in a Saxon persons name 'Egges' defining the place he dwelled, by the ford in the river. But the very earliest written usage of the villages name dates from 1345 when it was referred to as 'Winckley' meaning 'Wineca's forest clearing but clearly the village is much older than that. More fuel to the fire? Winskill though, is old Norse and a 'Winskill' is the name for a windy shieling, or a small dwelling used in crofting areas during the summer. It's also used to sometimes describe several huts in high pasture and of course one has to remember that the Norsemen were here in Devon first, so there is probably something in that too. So forget the 'Olde Englishie' idea completely. So put them all of these confusing possibilities about how Winkleigh got its name together and really it actually doesn't really matter that much as they've always sounded similar. But I quite like the most ancient origins as being the most likely, or Likeleigh! Winkleigh is a village in a clearing on a hill, by a bend in the road - that first belonged to a Saxon invader called Winc ! In 1348, the Devonshire village of Winkleigh was near devastated by the Black Death, which was one of the most deadly pandemics in human history. But what was the main culprit for spreading the disease in the first place? Rat fleas carried on the back of black rats ! Over one third of the population of Europe had already died as a result of bubonic plague in the preceding year, along with over one fifth of the population of Britain. Devon itself losing over a third of its population. The hilltop village of Winkleigh was no exception and did not escape its ravages. 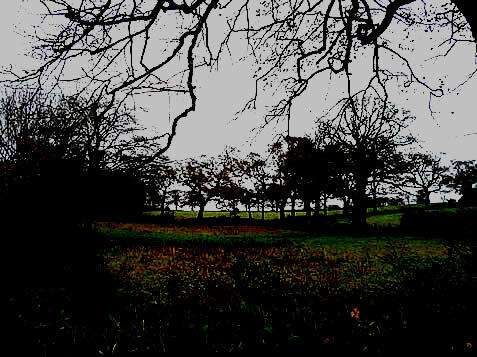 A field which lay to the north of Winkleigh village was consecrated and Carrion Pit Field became the final resting place of over a third of Winkleigh' inhabitants. No local Devonshire family remained untouched by this catastrophe. And yet, strangely, some say perhaps by divine intervention, the disease seems not to have affected either of the Devon villages of Barnstaple and Braunton only a few miles away and one story blames Bideford and its quays for the landing of the rats. Photograph: Carrion Pit Field, Winkleigh today . The daunting Carrion Pit. Near Winkleigh, Devon. Early in his career Bartholomew Gidley (Born 1611- Died 1702) had bought the manor and lands of the village of Gidley and later became Captain of the Tinners' Regiment, a unit which was composed of Devon tin miners who fought bravely in the King's Western Army in the Civil War. Burke's General Armoury tell us that; "By a large silver medallion in the possession of his representative, who at that time, Lysons wrote; (Gidley was) Exemplified by Edward Byshe Clarenceaux in 1671. A castle sa. 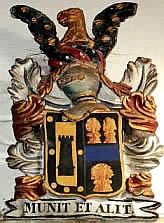 a bordure of the second Bezantee with crest, an eagle issuant or the wings sa. Bezantee. Awarded a kings commendation and his coat of arms. " Bartholomew Gidley eventually became a Justice of the Stannaries, a senior position of judicial authority in Devon & was a thorough and just judge. Ironically, many of the Gidley descendent males thereafter, attained high ranking in the army and police forces, several becoming Police chiefs and in authority in judicial and law enforcement associated occupations in the centuries ahead. More importantly and as history records, Bartholomew Gidley was indeed high up in the Squire - Archy & the defender of Winkleigh. Winckleigh, alias Winckley Tracy, alias Winckleigh Keynes, Colrudge, Nymett Rowland, Brushford, Monkenzeale, alias Zeale Monachorum, Lapford and Bundleigh"
"It was Bartholomew Gidley, who stood steadfast by the side of his king in battle and was rewarded with a silver medallion by the King for his services." What is clear is that Bartholomew Gidley fortified the hill town of Winkleigh against the threat of Cromwells forces led by General Thomas Fairfax & made the village into a 'stronghold'. Though quite what that term means is still actually unclear. However, it seems that Winkleigh was so well prepared and concerning to the prospective Royalist invaders, that Cromwells army bypassed the village of Winkleigh entirely on its way to confront King Charles Royalist army at Torrington. Choosing an alternative route via Chumleigh from Crediton where a further battle ensued. What we do know is that following the campaign in Cornwall, the Kings forces were encamped at Okehampton before making an effort to relieve a besieged Exeter & fortifying Winkleigh may indeed have been discussed. Map: Benjamin Donn's survey of Devon 1765. John Acland had taken over Torrington for the King, concerned that the Roundheads had amassed over 700 men under Samuel Rolle and Colonel James Chudleigh from their stronghold in Barnstaple, only 10 miles distant and the ensuing grim battle is is now history. It was the last major battle of the Civil War and proportionately one which saw more deaths than the Ist and 2nd World Wars combined. Yet Torringtons battle is rarely mentioned and seldom so when it is, even in accounts of the Civil War. The awfulness of battle back then would have been immense. Locals fighting with the Kings forces against a common and intimidating foe. They were neither bearing weapons issued by the armoury nor were they trained. Instead, they simply used anything they could get their hands on to fight with. So it was not uncommon to find Devon men armed with pick axe handles with spikes driven through them, axes, garden rakes, clubs and even modified saws. Hand to hand and close combat was the norm. The casualty rate colossal and the terror and conditions would have been beyond belief. Swords were hard come by and reserved for the elite and army. It would have been an unbelievably awful and bloody contest. In Hartland, a force of 700 such 'clubmen' gathered to oppose Gorings' Horse and Borough accounts show a strong local community effort to ward off the marauders.
" Some had heavy clubbs, some, thick quater staves with iron, steel pikes at the end, others with a sickle, others just gardeners rakes with iron teeth. Some with long helved pick-axes. Some with hammers. Some with saws instead of swords and divers other such kind." 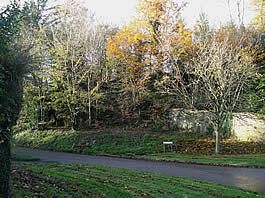 The Winkleigh stronghold, as its has been called, may well have meant nothing more than using the church building as a fortress & constructing a number of vertical timber barriers erected below and around the village prospect to protect a small contingent of musket men, harquebusiers and archers. This muscle could easily have been mustered by Bartholomew Gidley and sent by the Kings force to support the village and defend the roadways to Torrington. In fact this is largely borne out by common sense, as the King knew he had to support Aclands southern flank in Torrington and had previously made a habit of 'fortifying' churches in and around Devon. This gave great physical advantage to his lookouts. He also held a position of strength just five miles away at Cadbury Hill fort which overlooked the Chumleigh route and from where this guard probably came. This premise is further borne out by an account of the 9th of February 1646, which describes a 'guard' at Newbridge over the river Taw and more importantly, that they, the Royalists, also placed a guard at Winkly Beacon. So the term stronghold is most likely a misused phrase and in fact it refers to just a number of well trained individuals set upon defending the Kings position at the roadhead at Winkleigh and placed under the command of the most obvious candidate, Lord of the Manor, Bartholomew Gidley. A fine, trained Kings officer and that the fortification itself, was indeed the Church. Fortified Bastion - Cadbury Hill, an earthwork fort near Eggesford, Devon Deep in Heywood is a motte and bailey castle, all that remains of a once imposing Norman fortress. Now a scheduled ancient monument and site of serious gatherings of force during the Civil War and of Dragon sightings, witchcraft rituals and mysterious lights in the skies at night! Cromwell would certainly not want the additional bother of serious skirmishes en route to Torrington and an unnecessary conflict which would undoubtedly end up in the massacre of local women and children. 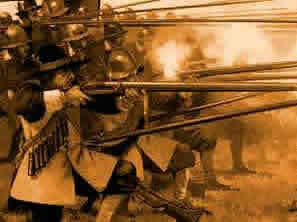 It would have been a battle that would after all, cost lives on both sides and delayed his attack on Torrington. Such a skirmish would have curried no political favour with the English populous after his coup and route of the Cavalier King either. Well placed rumour too, that always works. A rumour would spread like wildfire across the county. Just a mention that the village had become heavily fortified with cannon & musket bearing riflemen. That the place was overflowing with seriously strong men of foot who held a commanding position above the roadway. This may well have added to the Roundhead decision to avoid Winkleigh altogether at all costs and move on Torrington from its eastern boundaries. An almshouse was founded in Winkleigh in 1681 by Sir Bartholomew Gidley to house four poor widows but it had no endowment, except for the upkeep of a small piece of land for growing and keeping it in repair of £4.00. 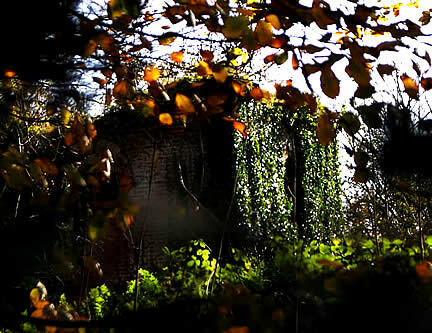 of the village shows them in disrepair below the church. Today, the Almshouses have been converted into 2 private dwellings under typical Devon thatch. 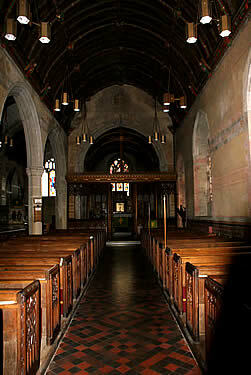 known as the Bittbear aisle in the Winkleigh Parish Church of All Saints. 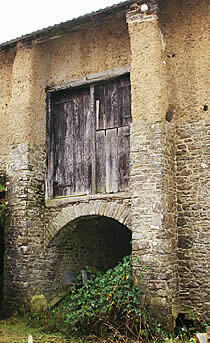 Winkleigh prospered throughout the Middle Ages with a population of over 1600, weekly markets & an annual fair. Though when you look at the place now, its hard to see where they all would have lived? So 'self efficient' is probably a good enough phrase to use when describing the Borough Town. and reaping the benefits of change and happened to be in rather a nice part of the world. All Saints Church, Winkleigh -Devon. The Canadians at Winkleigh Airbase. The US Air Force at Winkleigh. Photograph: Scotch Blackface sheep behind Winkleigh Court, Devon. Unauthorized use of the images illustrated is prohibited and protected under international laws of copyright. 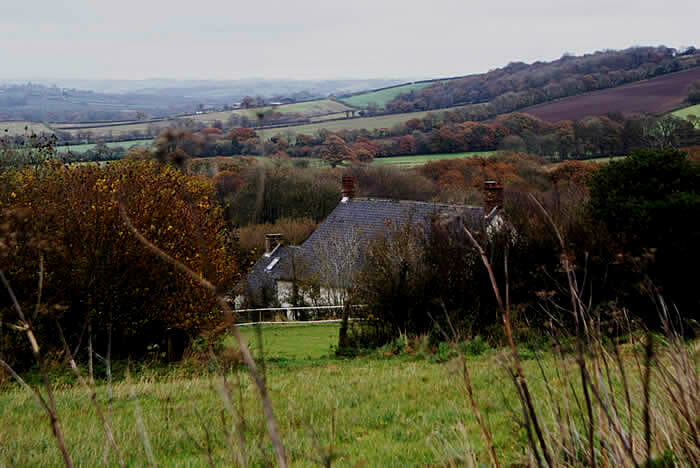 On this page: The Devonshire Village of Winkleigh in the county of Devon, England.